Have an American express credit? 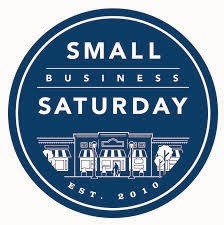 Registration for "Small Business Saturday" just opened today. Once you register your card you can use that card at participating small businesses on NOV. 30th and you'll receive a $10 credit to your account. So if you spend exactly $10, that purchase will be completely free. If you spend $14, that purchase would in effect cost you $4. Registration is limited so do it right away. Multiple american express cards can be used. So if you have 4 cards you can get $40 of credit statements... Another benefit of having many credit cards. This has been an annual event so if you misses out or don't have an American express card, plan now and gets some cards. Here's a MAP of participating small businesses. Some people have purchased gift cards at participating locations for $10 so they get the whole purchase refunded and so they can use it on a different day other than Nov. 30th. For example, if you have 3 different registered cards and a participating restaurant sells gift cards, you could purchase 3 separate $10 gift cards that can be used on a different day. As always, credit cards are ONLY beneficial for those that can wisely use credit cards.